I am so excited to share my adventures and discoveries at the South Pasadena Farmers’ market, but before doing so, I want to provide a bit of context for this blog – as this is my first posting. Life was quite copacetic for me until Memorial Day weekend this year. Up until then, my then fiancé, George, and I were living on the Upper West Side of Manhattan, planning our September 2008 wedding and enjoying a relatively comfortable way of life as I was working as an attorney and George was working for a big company downtown. Two days before the kick off of summer, George was asked by his company to relocate to Los Angeles and take a new job. The decision was an obvious one and in the midst of wedding planning, George moved to California. I would continue to work through the summer and join him after our wedding. The summer fortunately passed quickly, we had a beautiful wedding in my hometown on Long Island, and two days after our wedding we boarded a plane that would take us to a new city, a new way of life and to new challenges and obstacles that a few short months prior were not in our wildest thoughts. I am now a resident of Pasadena, CA, living in an apartment that is three times the size of our New York City apartment, and driving a car rather than riding the 3 train. As my life changed radically in such a short time, this blog is about this transition, its challenges and successes, but through it all, how I am finding comfort in what I like best – food and cooking. As this is my inaugural posting, there is nothing more appropriate to write about than the produce California has to offer any gourmande like myself. Since I arrived, the buzz around town is that the South Pasadena Farmers’ Market (SPFM) is the place to be on Thursday evenings. Located on Mission Street and Meridian Avenue in South Pasadena, a funky suburban town that has a vibe similar to Park Slope in Brooklyn, the South “Pas” Farmers Market is truly a produce Mecca. Similar in style and layout to the farmer’s market to end all farmers’ markets – the Union Square Farmers’ Market in New York City – the SPFM offers produce and variety that one could never find on the east coast – or at least outside of some specialty store. A beautiful example of a West coast produce wonder! Walking around the SPFM was nostalgic as it reminded me of New York, but exciting and new in so many different ways. For one, it was a quiet experience – the sounds of taxis and buses were not there, and the smell was different – the smell of basil infused exhaust could not be detected at all… The smell was instead sweet, one of fruits and heirloom tomatoes combined with a scent that I am not familiar with yet – perhaps it was palm tree? While the Union Square Farmers’ Market in New York is magical – a calm oasis of sorts in an otherwise busy metropolis, the SPFM – at least for now – will be a challenge to my culinary routines and comforts. This time of year in New York, the farmers’ markets are laden with apples from the Hudson River Valley, eastern Long Island and New Jersey. While recipes of apple crisps and apples pies are fresh in my mind, Southern California, and especially the SPFM, offers new ideas for fall recipes and creations. Among the farmers’ tables at the SPFM were varieties of fruits and vegetables that I have never seen, or would never have the occasion to see at a farmer’s market back East. 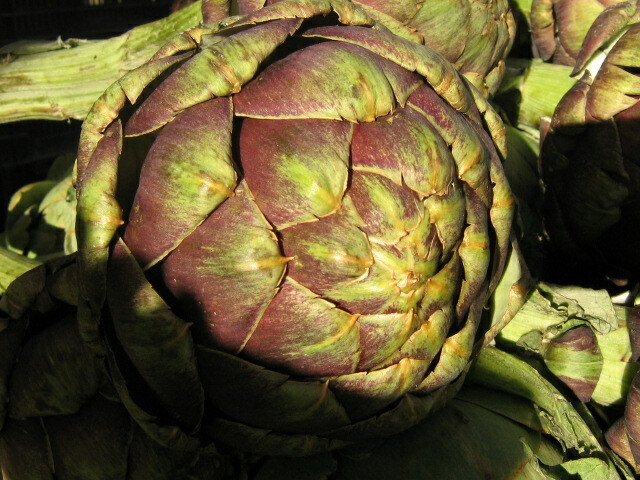 Artichokes, black figs, white radishes, rainbow chard and edamame pea sprouts lined the farmers’ tables. 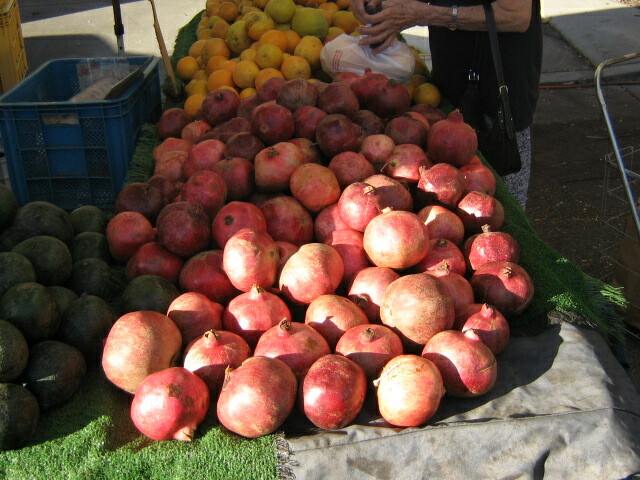 A large pear quash and pomegranates were veritable gastronomic wonders to me, but common place for SPFM customers. An orange orb with a little green stem similar to a small pumpkin struck my interest, and during my conversation with its farmer, learned that it was a type of persimmon that “tastes like bar soap when not ready to be eaten.” There were many varieties of lettuces, from baby greens to arugula to frisee, all of which were so clean and fresh looking. One lettuce farmer, from Living Lettuce Farms in Reseda, CA (http://www.livinglettuce.com/index2.htm) explained that the lettuce was so clean because it is grown hydroponically, which is essentially a farming technique in which the plant is grown in nutrient-infused water, rather than soil. Absolutely fascinating! I also discovered later that night that with a little extra-virgin olive oil and a few minced shallots, hydroponic lettuce becomes a tasty side for any dinner! While my culinary wheels were churning at mach speed and my tastes buds salivating during my time exploring the SPFM, my experience was bittersweet. It was a reminder of what I have left and the challenges – both in life and in the kitchen – that lie ahead. This entry was posted on October 18, 2008 at 1:51 am and is filed under California Produce. You can follow any responses to this entry through the RSS 2.0 feed. You can leave a response, or trackback from your own site.